This controversial, impassioned call-to-arms for a return to the ideals that fueled the French Resistance has sold millions of copies worldwide since its publication in France in October 2010. Rejecting the dictatorship of world financial markets and defending the social values of modern democracy, 93-old Stéphane Hessel -- Resistance leader, concentration camp survivor, and former UN speechwriter -- reminds us that life and liberty must still be fought for, and urges us to reclaim those essential rights we have permitted our governments to erode since the end of World War II. 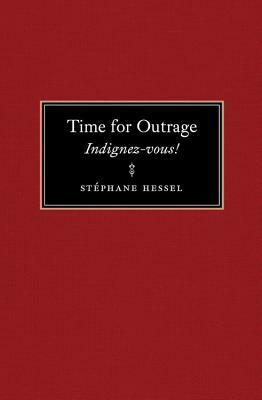 Stephane Hessel was born in Germany in 1917, emigrated with his Jewish writer father and mother to France in 1924, and fought in the French Army in 1940. After being captured by German forces, he escaped from a prisoner of war camp and joined General Charles de Gaulle's Free French in London. On his clandestine return to organise the Resistance in France, he was caught, arrested, tortured and sent to concentration camps. He escaped death to work after the war on drafting the United Nations Universal Declaration of Human Rights, whose ideals he defends passionately to this day. 'The book urges the French, and everyone else, to recapture the wartime spirit of resistance to the Nazis by rejecting the "insolent, selfish" power of money and markets and by defending the social "values of modern democracy." "This slim but powerful volume answered the public's need for a voice to articulate popular resentment of ruling-class ruthlessness, police brutality, stark income disparities, banking and political corruption, and victimization of the poor and immigrants." "INDIGNEZ-VOUS! is creating the sort of stir in France Emile Zola did in 1898, when he published J'Accuse!" "Like a song you hum or a film you recommend to friends, INDIGNEZ-VOUS! crystallises the spirit of the time. To buy it is a militant act, a gesture towards community and participation in a collective emotion."